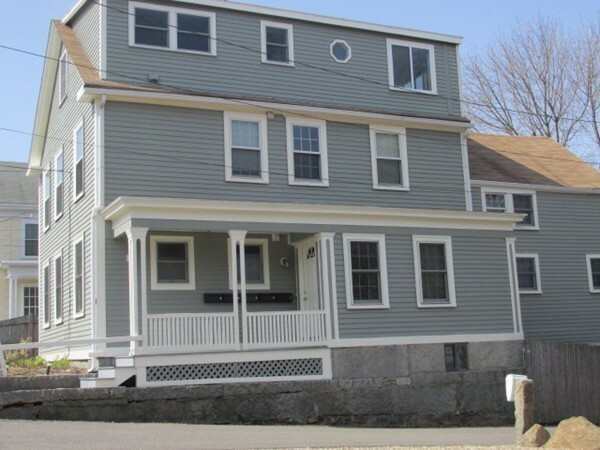 4 Pleasant St Rockport, MA 01966 - Condo home | Patty Knaggs Heather Numerosi Gloucester MA RE/MAX Advantage Real Estate Agent. Buy or Sell your Home with Patty Knaggs. Sunny and bright first floor condo.Located just beyond the edge of downtown just off Cove Hill. This stylish one bedroom condo has many perks. Close to - harbor, shops, restaurants,post office, Main St, Dock Sq. and Old Garden Beach. Short distance to Front and Back Beach . One mile to Commuter rail line.This pet friendly association allows for a dog and cat. Several bonus findings in this unit include- winter water views inside and outside, outdoor space, views of town, oversized stackable, move in ready newly painted in trending calming colors. Recent complete renovation of the kitchen and bath. Some historic features intact and preserved. Beautiful gleaming wide pumpkin pine & hard wood floors freshly refinished . New bath offers a new wide low lip shower, fan, vent, upgraded fixtures and lights . Nice high ceilings & large windows w/custom quality blinds.Call today.